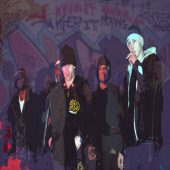 Rapnews.co.uk Rapnews.co.uk UK rap, grime and hiphop culture resource! » Blog Archive » Win Bare Records Vinyl! What large vehicle do The Phobia drive through town in their video for the track ‘Keep It Moving’? E-mail in your answer with your name and address. One entry per person. Uk entrants only. Closing date is the 17th of May. COMPETITION CLOSED. WINNER IS TOM! all answers to e-mail only please guys. Like I said, entries must be e-mailed in.